Every Saturday, I host a feature called Kid Konnection -- a regular weekend feature about anything related to children's books. This week I'm going to share a picture book starring two adorable characters. Summary: In this lively addition to the funny Peep and Egg picture book series for toddlers, a reluctant chick named Egg overcomes her aversion to taking a bath. 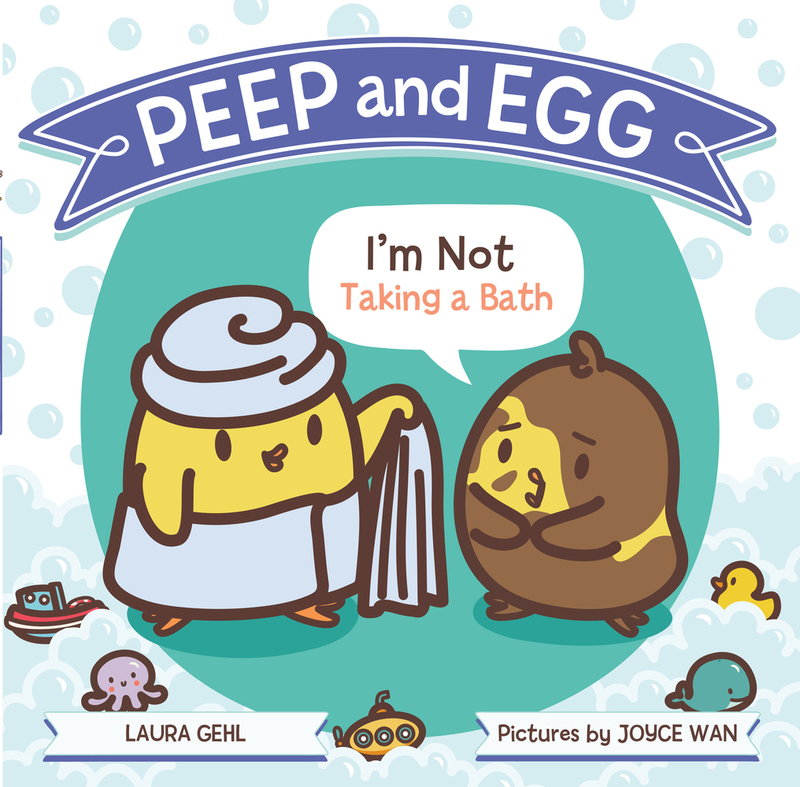 PEEP AND EGG: I'M NOT TAKING A BATH by Laura Gehl and pictures by Joyce Wan is adorable. This picture book, aimed at children ages two to six, is actually the third book in this series -- with more on the way; but these precious little characters are new to me! 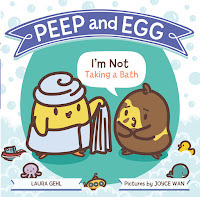 PEEP AND EGG: I'M NOT TAKING A BATH will surely entertain toddlers with the fun story and super-cute characters. Egg isn't really fond of baths, but Peep thinks Egg should take a bath because he's covered in mud after playing with pigs. Peep tried everything including tempting Egg with some bubbly shampoo, a dip in the dog's water bowl, and even a visit to the river; however, Egg always finds a reason not to get clean. It's only when Peep gives up and leaves that Egg decides a bath might not be so bad... and maybe could even be fun! This little picture book is positively precious. I know toddlers will relate to this story about Egg's reluctance for a bath, and they might even appreciate the overall message that baths can be fun. However, it's the illustrations in PEEP AND EGG: I'M NOT TAKING A BATH that brought this book to the next level for me. Peep and Egg are very round (as are all of the characters are in this book), and I couldn't help but fall in love with their cute little bodies. I think little ones will feel the same way! If you think Peep and Egg are as cute as I do, you might want to check out these activity pages. Giveaway alert: There are two great giveaway opportunities! 1. One grand-prize winner will receive a signed copy of PEEP AND EGG: I'M NOT TAKING A BATH, Peep and Egg stickers, and a complete bath time fun collection that includes a giant hooded frog towel, duck water spray bath toy, rubber duckies, natural bubble bath, and a colorful assortment of made-in-USA fizzy bath balls. 2. Ten lucky runners-up will receive a copy of PEEP AND EGG: I'M NOT TAKING A BATH. I just got a set of this series. They look super cute and I’m confident I’ll love them too! Thanks for the link up! This book reminded me of when Vance was small - Vance was a lot like Egg. I bet a lot of kids will be able to relate to it.